I have had the new Garmin Astro DC 30 for a month now, and it works. Unlike the Tracker, Wildlife, and Marshall telemetry units there is no learning curve, it works from the start. 70+ year old Hall of Fame member Bill Hunt was using one in 3 minutes from the time I placed it is his hands. A guy like Bill is unlikely to ever use many of the functions, like me he has to concentrate to use the remote for his TV, but to just locate a dog and tell if it is moving or on point, you only need the first screen that comes up when you turn it on. Now I am pretty sure this thing has a button that will tell you what the quail had for breakfast and where their grandfather lived, but it really is simple to use. 600 bucks, light enough to meet AF/AFTCA guidelines (AKC approval pending), and even this old guy can use it, what's not to like. Cool. How is the tracking screen? I think the thing refreshes every five seconds, which is a long time if a dog is running and changing directions. Is it jagged? Does it seem accurate? Cabela's has one on hold for me and I am planning to go down tonight to get it. I have yet to meet you, but hopefully one day will. I met Bill Hunt last year while I was up at Blake's house. We went over to his house and hung out for a few hours. He's a nice guy. He showed me his garden he was so proud of. I thought it was neat that he had a headstone out in his yard when you come in his place. Had the names of some nice ones he had handled on that stone. I remember CH Rebel Wrangler, but can't remember all the others on the stone. I thought it was a great tribute to some great dogs he had handled. At 23 mph the 5 second interval is a good stretch on the 80 ft screen, but on the handheld it is seamless. No, I don't work for Garmin, but if there was ever a product I could endourse, without or with compensation this is it. Do I understand your post correctly that it is APPROVED for American Field trials and pending with the AKC?? I know there revised collar looked like it would meet the size requirements, but I didn't know how far along in the approval process they were. It makes perfect sense that they would approve it. If it is the same size of the tracker collar, but better technology to find a lost dog. The AKC has normally been slow to approve stuff like this, but I really hope that they move quickly on this one. 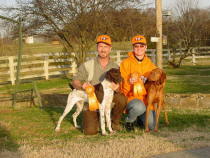 kbshorthairs wrote: Do I understand your post correctly that it is APPROVED for American Field trials and pending with the AKC?? I know there revised collar looked like it would meet the size requirements, but I didn't know how far along in the approval process they were. It makes perfect sense that they would approve it. 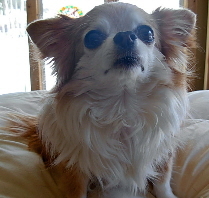 If it is the same size of the tracker collar, but better technology to find a lost dog. Given the GPS system is a high-sensitivity one, I think the Astro is a legal "no-no" in Canada. Even though I know you guys can get your hands on them through various means, could they ever be used in trials there? It is the MURS system that is the no-no in Canada. High sensitivity is used by many. I haven't heard if it is a faux pas, however if it is like the Rhino system (5 watts), nothing will happen and it will eventually be ok as that is what happened with the Rhino. I'm gonna use it, FWIW. As for trials, I don't think there are any CKC trials in Ontario (to my knowledge), but for our hunt tests, I'm pretty sure they are not allowed (I'd have to check to be sure). We do have a few American Field trials in Ontairo, so if you can use them in the US, you could use them here. I don't know if they are allowed with AF, do they follow AKC?? gar-dog wrote: ...could they ever be used in trials there? AKC, AFTCA, and AF have the same general guidelines for tracker collar use (transmitter must weigh less than 5 ounces), but AKC approves specific models by name and they prohibit GPS, so they are reviewing the Garmin Astro to have a determination by the end of the year. It meets AFTCA/AF guidelines. Don't do what I did- I lost the handheld unit on my very first hunt with it. It seemed pretty secure on the belt clip which I had secured to my vest, but I looked down, the clip was still there but no astro. Boy was I mad. 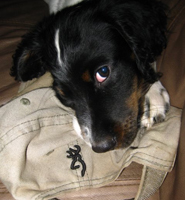 jsd245 wrote: Don't do what I did- I lost the handheld unit on my very first hunt with it. It seemed pretty secure on the belt clip which I had secured to my vest, but I looked down, the clip was still there but no astro. Boy was I mad. If you paid for it with an AMEX and it was in the first 90 days, you can recover the cost therough their Purchase protection. I wanted to buy one for $550 from a GDF sponsor, but they dont take AMEX. I have one on hold at Cabelas, they charge $599, but I have the $150 cash card. However, today I found one online today for $546 and bought the last one. By the time I figured gas to Cabelas at $50+, $60 more in price, and $36 for sales tax, it was a push. Plus I don't have to have a 4-5 hour ordeal and be forced to spend $150 at Cabelas in the next few months. They should make the covers in blaze orange, or one should put blaze orange tape on them. I bought a whistle lanyard for the Rino I have, I can hang it around my neck & put the unit in my pocket so I don't have that weight around my neck - but if I drop it, it doesn't go far. You could also loop the lanyard around D-ring, belt, etc. I got even more POd about this today. I had bought the topograhic maps and city navigator on cd rather than preloaded SD cards, so I told myself at least I wouldn't have to buy those again- WRONG - Garmin only lets you load the city navigator onto one unit, so I have to pay another $99. I can reload the Topo maps though. nj gsp wrote: I bought a whistle lanyard for the Rino I have, I can hang it around my neck & put the unit in my pocket so I don't have that weight around my neck - but if I drop it, it doesn't go far. You could also loop the lanyard around D-ring, belt, etc. Thanks. My thinking was that although the Rino is waterproof, it doesn't float - and even if it did, there's no way I catch it before it hit bottom or went off down river when fishing. Dang, another great idea! You are my new "Hunt Coach." Send them an e-mail and suggest they make it in orange. They actually listen to their customers, so if enough people ask, they probably will. In the meantime, maybe you can wrap some tape on it or something. I know Vern is fast, but how did he run out of the collar? As hard as the buckle is to fasten and take off, I doubt it came loose. Are the basemaps any good or do you guys have the Mapsource Topo 2008? Vern is a pretty fast dog, but I don't think he can run out of the collar yet! = Near as I can figure, one branch somewher along the line probably pulled the excess strap out, and once it was hanging free another one somwehere along the line caught it and unbuckled it. Luckily it was only about 50 yards inside the Grouse woods, as it happened as we were coming back out. The base maps don't have much detail, but you don't really need any if all you're doing is tracking the dog. I loaded the topo maps and city navigator because I use it for a GPS in my car. City navigator is the default top layer, I just go in and turn it off when I'm on a hunt or in the woods tracking my dog and I the topo map comes up which is pretty well detailed. It's a little difficult to figure some of the features out, for instance I had the hardest time trying to figure out how to turn the city navigator layer so I could see the topo map when I have them both loaded onto the SD card, the manual doesn't go into much detail. However, it pretty much does anything you'd want it to. I have a question for anyone else using the unit- is there a way to turn up the volume on the point warning? Or have it beep more than once? I have not been able to find a way to make it louder or chime more than once for point. You can change the alert tone easy enough, I found one that is a longer ring. The tech support folks at the 800 number are very good, but I have not asked that question. I am not sure of the value of the topo on the handheld unit, but it is great when you download to the computer and go to the 80 foot scale. It almost shows the bush the dog ran behind. Resist! Resist the temptation, Greg! I've tried calling Garmin tech support- every time I call I end up getting a message that the waiting time will be something like 30 minutes. I think I will email them. I went on their web site and used the look up feature in their FAQs which is pretty helpful, but I have not been able to find anything about the point tone. I actually like the detail the topo maps give even when on the handheld it'll show more roads and water features than the base map as well as contour lines. It's nice to have the roads on there as a reference. This comes in handy- like today when I was walking Ava in the woods and she took off chasing something which she has never done. I'm thinking it might have been a deer, but I've jumped deer with her before when we were very close to them and she's never chased. She ended up 900 yards away crossed a dirt road that runs back there and it seemed like it took her about 10 seconds. It's amazing how fast they can get out there. I was about to have a heart attack because that road eventually run out to a paved road and I was afraid she'd follow it. I was able to get within about 700 yards and I called her and she came back, I would have had no idea where she was without the Garmin. I'm not sure if she actually heard me at that distance or she started freaking out and tried to find me, but I was that much closer. Prior to this she'd never gone more than about 150 yards away from me without coming back to check in, at least to the point where she could see me. It is pretty cool to come home and download the track on your computer and check it out. I'm heading up to Maine next week for a few days to hunt grouse so hopefully this time I won't lose it. I'll take some of the advice given above. It'll be fun to come home and download all the tracks and flushes and "relive" the hunt. Hopefully we'll get alot more bird contact than we did last weekend in upstate New York. 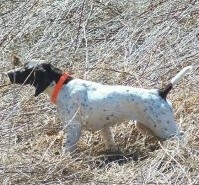 Were were able to shoot 1 Grouse over her first "wild" bird point . It was acutally her first real hunt ever, she was too young last season. One other pretty cool thing I've been playing with tonight- you can overlay all your tracks in Google Earth and view them on satellite imagery- depending on the area Google earth is pretty detailed- In my area in Ct I can actually see my house on the Satellite imagery. jsd245 wrote: One other pretty cool thing I've been playing with tonight- you can overlay all your tracks in Google Earth and view them on satellite imagery- depending on the area Google earth is pretty detailed- In my area in Ct I can actually see my house on the Satellite imagery. Very cool! Can you do that with the "free subscription" to google? Mine better get here by wednesday of next week! I ordered online Saturday and it still hasn't shipped. I bugged them today and they said it should ship tomorrow and "please allow 5-8 days." I think they ship ground. Hopefully the ship from the East Coast. Yeah, you have to have Google Earth on your computer and a broadband internet connection. It also works with the free waypoint and route manager that I think comes with most Garmin handheld devices. I've had a little trouble with mine, which I'm sure is operator error. The default postion for what the dog is doing is "treed". I can switch it to "point" okay, but when I turn it off and use it another time, it's back to "treed". Anyone had this problem at all? Also, sometimes I found the arrow wasn't always pointing where the dog was. I realize there could be up to a 5 second delay, and the dog can move quite aways in that time, but sometimes it was off 90 degrees. Now I've been recalibrating the compass each time out, and it seems much better. Otherwise, it's been an awesome product. Very comforting always knowing where your dog is. 47sgs wrote: I've had a little trouble with mine, which I'm sure is operator error. The default postion for what the dog is doing is "treed". I can switch it to "point" okay, but when I turn it off and use it another time, it's back to "treed". Anyone had this problem at all? Also, sometimes I found the arrow wasn't always pointing where the dog was. I realize there could be up to a 5 second delay, and the dog can move quite aways in that time, but sometimes it was off 90 degrees. Now I've been recalibrating the compass each time out, and it seems much better. Otherwise, it's been an awesome product. Very comforting always knowing where your dog is. You should only have to calibrate the compass once in my brief experience with the unit. When you are trying to locate your dog- sometimes you"ll notice that it flashed the message "hold level" once in a while. Pay attention to that, I've found that in order for the compass arrow to correctly indicate the direction of the dog , the unit does, in fact need to be held level. Otherwise the point points every which way. Run the webupdater to get a software update. If you need directions, they are here. You have to go to the other screen and change the type of dog to pointing dog, be sure to turn the treed "off". Anyone know why it shows the dog sitting sometimes instead of pointing? I wish that icon wasn't even on it. Gramin was gemerous enough to donate an Astro to the AFTCA Bass Pro Shop Youth Trial, it went to Larry Huffman. The trial proved at least two things 5 year olds can do better than I can; handle an All-Age dog in 3 acre field and use an Astro. Well I just got mine today and I must say I am impressed with it at first blush out of the box. Only initial comment is they should probably have two collar sizes as I have a Brittany, not a St. Bernard. I cannot WAIT to get it cranked up. Unfortunately I don't have any AA batteries handy. But the packaging, case, contents, and initial quality seem top notch! YahoooooooooO! 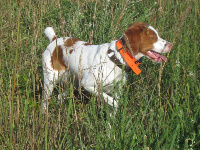 gar-dog wrote: Well I just got mine today and I must say I am impressed with it at first blush out of the box. 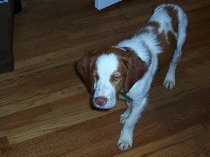 Only initial comment is they should probably have two collar sizes as I have a Brittany, not a St. Bernard. I cannot WAIT to get it cranked up. Unfortunately I don't have any AA batteries handy. But the packaging, case, contents, and initial quality seem top notch! YahoooooooooO! Check back for new updates from time to time also. Did any of you guys cut the collar down? I worry mine will chew on the end. gar-dog wrote: Did any of you guys cut the collar down? I worry mine will chew on the end. You mean instead of hunting birds? Why would you leave the collar on the dog when you weren't running it? ohmyjohnny had the collar come off his dog, thinking it may have been the excess strap getting caught on something. I reread his post, but had initially thought maybe the dog had pulled on it. I just got back from 3 days of hunting in Maine (I posted in the hunting section if you're interested), and I like the Garmin even more. We put alot of miles in and it performed flawlessly. I used it to navigate the roads on the way up, Kept track of the dog, no malfunctions (and it got banged up pretty good as did my dog), and I had great peace of mind in the heavy cover knowing where she was. I still have the complaint about the point beeper beeping only once and not being loud enough, but that is about my only criticism. And this time I didn't lose the handheld on the first day. Question - how long does the battery on the collar last before needing a recharge? I've heard 17 hours. But I'm not sure if that's true or not. I know that mine will last for a few trips out to the field and it hasn't failed me yet. And I nice feature I just noticed the other day is that it shows you how much battery life is left for each collar on the dog info screen. Where have you guys found the best price and timely delivery on the new Astro? Sportsman's warehouse in Missoula Montana has them in stock for $199 (less one). I would guess that if they are on the shelves in Montana then they may also be stocked in more civilized areas, beyond the frontier. for sale in the store for $200? Sorry to sound like a jerk, but I find that hard to believe, msrp is 650 and lioncountry supply has them for 5. If it's true, "bleep", that's an unbelievable deal. lightonthebay wrote: Sportsman's warehouse in Missoula Montana has them in stock for $199 (less one). I would guess that if they are on the shelves in Montana then they may also be stocked in more civilized areas, beyond the frontier. That price must be referring to the collar only, not the collar and transmitter. phermes1 wrote: That price must be referring to the collar only, not the collar and transmitter.